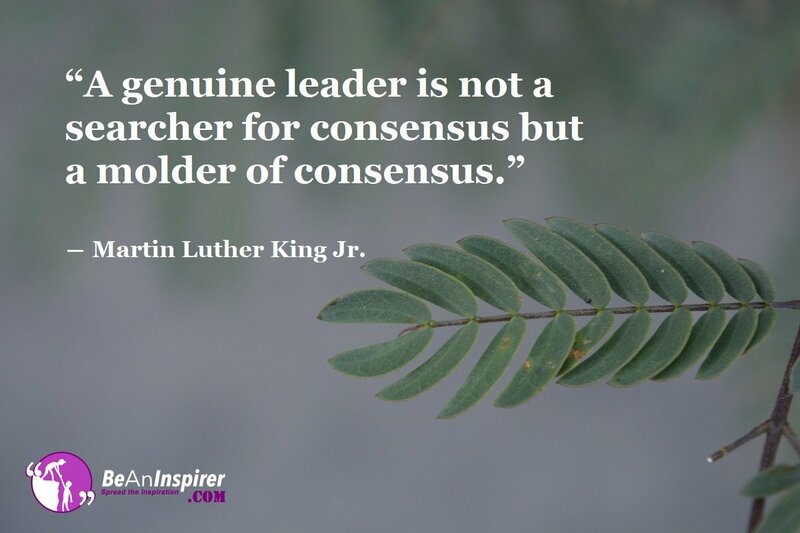 “A genuine leader is not a searcher for consensus but a molder of consensus.” ― Martin Luther King Jr.
Do you think you have the potential to lead a group of people towards some noble purpose? Do you think you can inspire people into doing something sublime for a social cause? If you have the wish to dedicate your life to inspire others, then there is no better way to serve society than by being a leader. You can be a true leader if you can translate your elevated ideas and thoughts into reality. It is your sincere efforts and wholehearted commitment towards some purpose which can turn you into a genuine leader. Here it is pertinent to mention that the mere wish to be a leader won’t suffice. You must be passionate about the cause to which you want to dedicate your valued time and focused attention. Normally people have great ideas but as they don’t have the required enthusiasm to pursue their dreams, they fail in their pursuit of achieving their goals. It follows that if you can’t execute your novel ideas in letter and spirit, your chances of being a true leader are quite scarce. To be a true leader, you must be a source of inspiration for others. If you can’t inspire others into doing something noble or sublime, leadership is then not your cup of tea. You’ve got to understand this reality. The sooner you come to terms with your potential, the better it will be for your future and career. You must be an example for others to follow. Mind it that those who decide their course of action as per the mindset and taste of the people are sure to fall flat in the long run. A great leader is not one whose actions and thoughts are motivated by any personal gains. A true leader leads from the front and shows others the way to progress. Even a small kid doing something exceptional can be a great leader. A child can unknowingly do something which inspires others to work for the welfare of humanity. Let me clarify it by means of an incident which I came across the last week. I had gone to the market to buy some vegetables. A seven or eight-year-old kid was there in the company of his mother. While the mother was busy purchasing vegetables, the kid somehow happened to notice a piece of paper being thrown by someone crossing the vegetable market. Without saying anything, the kid picked up the piece of paper, took it to the nearest dustbin and threw it into the bin. I saw all this in utter amazement. The kid had done something which I had never expected from a child his age. I came back home with a sense of responsibility which that kid had begotten in me. To me, that child was not less than a leader. A small wholehearted effort on the part of the child motivated me to do my bit for society. Our country is in need of such leaders now. If I can be inspired by a small kid into keeping my surroundings clean, why can’t you do something which is inspirational for others? This is how leaders are born. A person doing a small day-to-day task can be a source of inspiration for others. At present, leadership is at its lowest ebb. True leaders are rare to be found anywhere. The reason for this scarcity of true leaders is that our actions and words are determined by the prospects of personal benefits and monetary gains. If there is some benefit in doing something, we do it delightfully and we hate doing those things which are not beneficial for us. You must cast aside selfishness and self-interest if you want to grow as a genuine leader. Selfless attitude is the first criterion for being a committed leader. By keeping aside all your selfish motives, you must work with a view to making a positive change in society. The answer is simple and clear. You must inspire the people into doing something sublime or something exalted which will be of a great value for humanity. If you succeed in inspiring even a single person, your life becomes meaningful and it is the first concrete step towards being a true leader. It means you must change the perspective and mindset of people towards positivity. If you can channelize the energy of a group of people towards the right direction, you have the elements of a leader in your character.